Our Fighting the Cause Breast Cancer Awareness Shirts are a great way to support the fight against breast cancer. Wear this unique t-shirt on your next breast cancer walk while educating everyone around you about the need for breast cancer screening. Love the shirt.It was a" hit" at the breast cancer walk in Central Park. 10/16/16 Thank you. Angela M Brooklyn. N.Y.
Love the shirt , it does say it all . I love the shirt. Excellent quality. Great product! Timely manner! All in all a grey shopping experience! Love the products I bought and can't wait to wear my shirt in the upcoming 60 mile Breast Cancer walk. 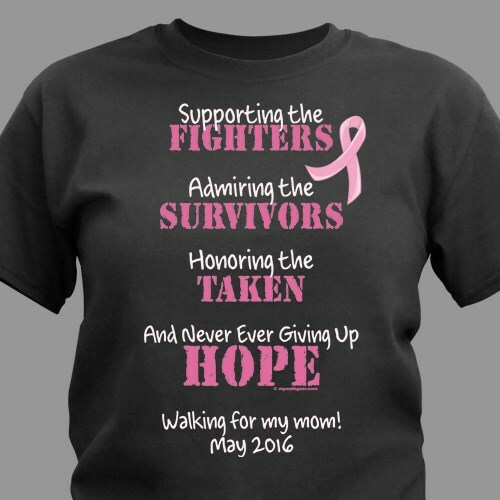 We offer many personalized breast cancer awareness t-shirts. These personalized shirts show your support for the cause and help in the fight against the disease. They're also great for charity events or breast cancer awareness walks. MyWalkGear.com has many Personalized Walk Apparel and Gear for your special gift giving needs. Each time a gift is purchased from our Breast Cancer Awareness line of personalized gifts, MyWalkGear.com will make a donation of 15% of the purchase price to help in the fight against breast cancer.